Winemaker’s Notes: An alluring blend of grapes from ancient vines that create a spellbinding libation with notes of dark berries, chocolate, hints of black pepper and plum. Incomparable with grilled meats flavored with big sauces. My Review: Another day, another Cashmere wine. It’s a tough life. 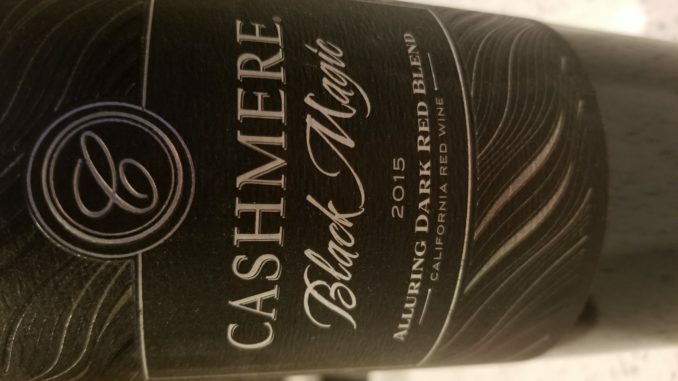 So in addition to the 2015 Cashmere Red Blend, I also received their Black Magic, which takes the basic structure of the Red Blend (Mourvedre, Syrah, and Grenache) and adds some Petite Sirah into the mix. So what did I think? The wine was darker in color than the Red Blend, and on the nose I picked up juicy dark berries with hint of tart cherry. In the mouth the wine had a medium body and I picked up flavors of tart cherry and raspberry. What was perhaps most impressive about this wine is that it didn’t show hot on the nose or in the mouth, and sitting at 15% alc/vol that is very impressive. My wife and I paired the 2015 Cashmere Black Magic with a goulash that we had made, and the warm, heavy meal was a good pick. Pairing this with grilled meats or anything that’s a bit heavier is a good pick, making it a great option this winter as we all move towards our heavier meal options. I’ll admit that I liked the Cashmere Red Blend better than the Black Magic, but that’s not an indictment of this wine, simply a preference. This is still a good budget-friendly wine for those upcoming holiday parties, and again, Cline is donating a portion of the proceeds to charity, so you can feel good about picking this one up.